Wednesday is here once again, and since I had last weekend off, and my laptop sort of behaved, I managed to process a bunch of pics for various blog entries, including this one. 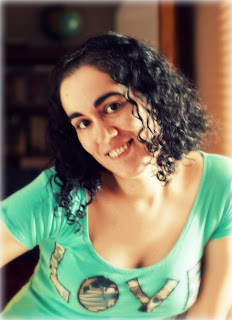 Since I intend to keep my 3 blog entries per week, I'll be alternating Traveling Thursdays & Wearing Handmade Wednesdays. Buying handmade mostly means buying online for me, and by a jest comment of the bf, and my own realization, I've noticed I barely find anything to buy offline that I really like, and sometimes when I do, I compare it to something I own, or I've seen in an online shop, and even if it might be cheaper, I just don't buy it. Last weekend I went shopping with a friend, and I only bought conditioner (one of the few things I still buy offline, along with hair mask, trousers, jeans & most shoes, and groceries, of course). Going through the shop I kept finding things she liked, and she went to try on like 6 or 7 items, I kept on looking at this loose tunic and thinking that I had one at home that was way more lovely, and made of habutai silk, so I paid more for it, but really, the feel of the fabric said it all! After this digression of mine, let's go back to our Wearing Handmade Wednesday entry of the week! Let me introduce you to the very awesome and inspiring, Bianca, the Canadian lady being the AlterEco Clothing brand and the ReLovePlan.et brand & dare I say, even movement?. She's an amazingly positive person, vegan, animal lover and a lover of our poor mistreated planet. 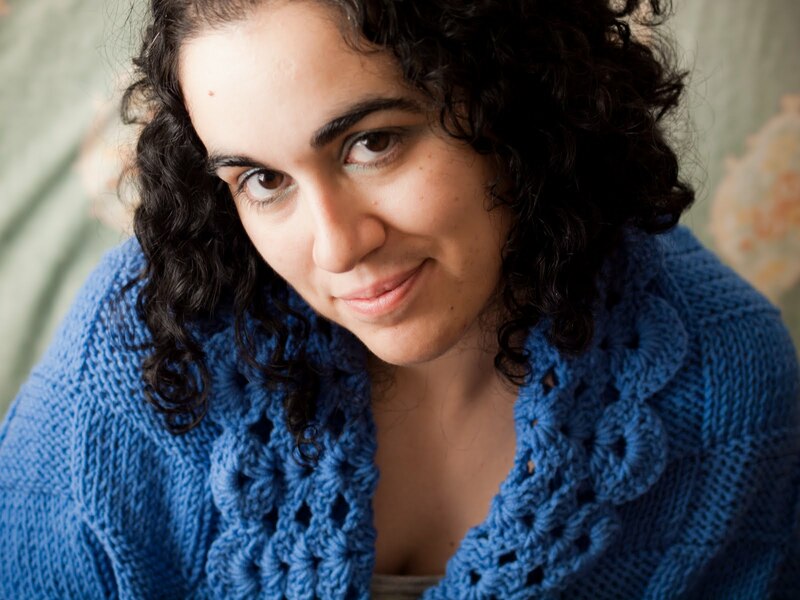 And she's not one just to talk, but also one to take action, so she reuses fabric & old clothes, uses mainly organic cotton & bamboo for her creations, and in her blog she has all sort of motivational posts, yummy vegan recipes and causes she believes & fights for. So, aside from checking her Etsy shop for her awesome clothing, do check her blog and her website, and if you want, you can like her on Facebook! 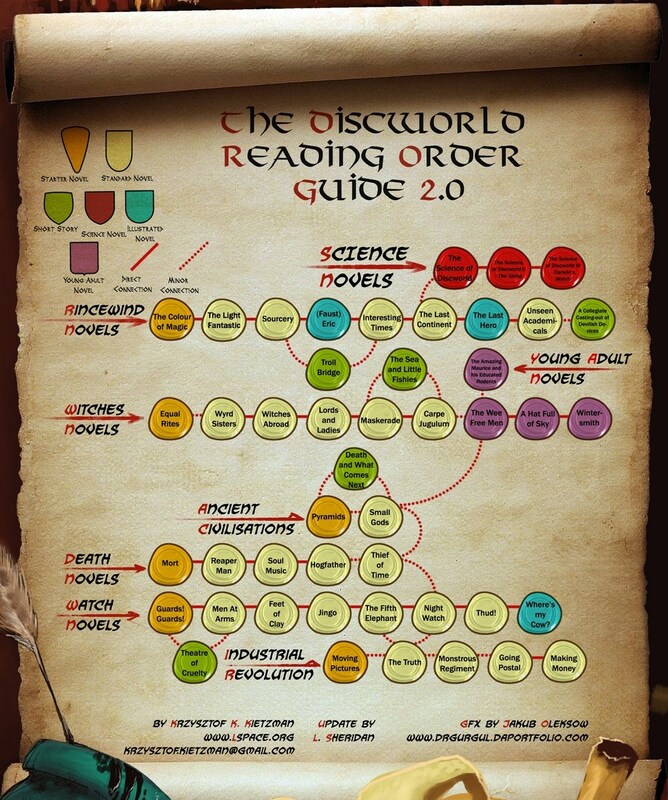 Mark This Book Monday: Discworld Series by Terry Pratchett!! A new week has arrived, with a fresh new Monday and with a new recommendation to feed your mind, and entertain it! Today I'm introducing you to a series that will keep you giggling and entertained for quite a long time. 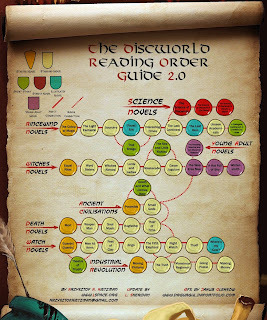 After all, the Discworld series has nearly 40 books already! The 39th to be published this October. You might be thinking that a series comprised of so many books can be too daunting to even try to start, or that it would get boring and dragging for so many books, but I can assure you nothing is further from the truth! First of all, as its own name reflects, it's a series of books based on the Discworld (a flat round world, riding in the back of a giant turtle, supported by four elephants, yeah, you read that right), but they are not the kind of books you need to read one after the other, they're actually divided into different story arcs, so they can be grouped into smaller series if you may, and even so, each book can be read as a story on its own, though of course, there are references to previous novels here and there. Here is a lovely scroll where you can see what I mean, and also, you can check the Wikipedia article (but be warned, there are spoilers!). So far, I've read all the Night Watch novels, except for the graphic novel "Where is my Cow?" and by checking the Wikipedia article, I just got excited since the next novel to come out, it'll be a Watch novel! Sam Vimes, Captain Carrot and the rest of the Watch are, so far, my favourite set of characters. Sam Vimes, his Excellency, is a copper, an old style copper, not the brightest one ever, but one that is hell bent on doing what's right, and has no regard for politics. Captain Carrot is a six-foot-tall dwarf, and the Watch as an equal opportunities policy, so there are dwarves, werewolves, zombies, vampires and even a Nobby Nobbs. Also, a very present character in this books is Lord Vetinari, the tyrannical ruler of Anhk-Morpork (the biggest city in the Discworld). I'd recommend you start with them, the first novel being "Guards! Guards!". My second fave series so far are the stories featuring Death, yes, the anthropomorphic personification of death, and his interesting family. Yes, Death has a family. 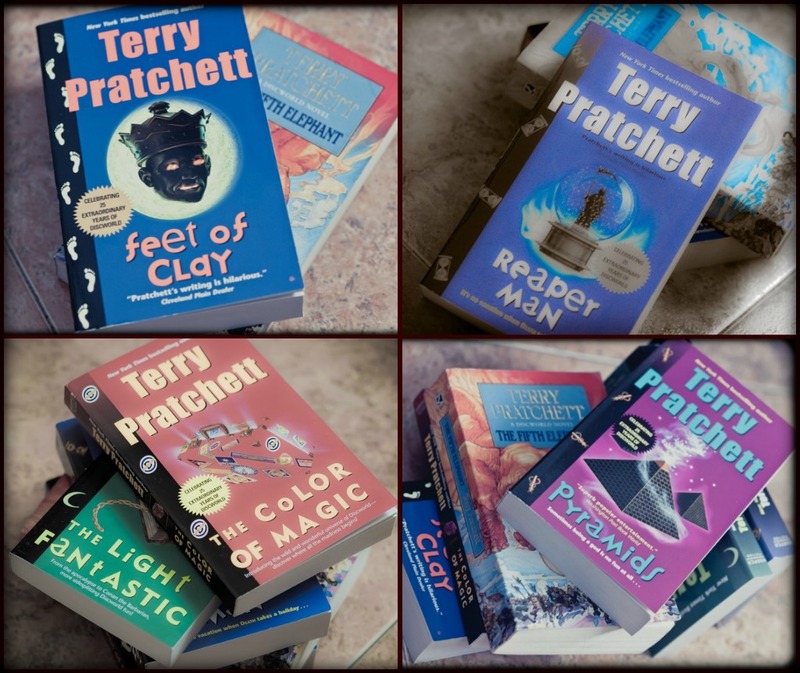 Even though Death appears in almost all books in the Discworld series, with his speaking in CAPS, there's a series where we meet his adopted daughter, his apprentice, his butler and his granddaughter. Oh, and Death is quite partial to cats too. Lots of irony and lots of comedy in these books. The first one of this arc is "Mort". I've also read on of the "Ancient Civilizations" books, called Pyramids, that for an Egypt & history fan & an atheist like myself, was absolutely hilarious! If you want to try a book that is not part of a bigger story arc to see if you like the writing style and the general feel of the entire series, I recommend you start with this one. Starting now with the Wizards & Rincewind series, I've read so far three of the books, "The Colour of Magic", "The Light Fantastic" & "Sourcery", and I've also started reading "Eric". So far, they're also a lot of fun, but the wizard characters are changing quite often, since wizards ascend in the hierarchy by stepping into their dead predecessors empty shoes, so there's a certain short life span for wizards of certain ranks. Also, I've just started reading the Witches arc. I'm really digging this books too, cause even if they're about witches, and witches do magic, it's not all about crazy mumbo jumbo, but more about headology and common sense, and well, magic when you just have to. So far I've read "Equal Rites", the first book, and I'm half way with "Wyrd Sisters". As you can see, I fairly like this series, it's chock full of references to world history & events, fantasy books, superstitions, fairy tales, and even Shakespeare! They're the kinda books that make you giggle and laugh out loud; and one of our fave parts when G & me are reading them, is reading hilarious passages to each other from whatever book the other is reading. Terry Pratchett really is well deserving of being Sir Terry Pratchett. Wossaname and Music With Rocks In It!! So, to pump myself up I've decided to listen to Iron Maiden and one of my favourite songs by them, Dance of Death. Among the many curious things about me, two are my fascination with Pagan religions, culture & imaginery for an atheist, and my love for all things Celtic for a Mediterranean! As a little anecdote, when G & me went to see Maiden in Valencia we thought they'd continue wit the setlist they played in the US, and G asked me what song I'd have them play that wasn't in the setlist, and I answered this one. Low and behold, they had changed their setlist and played Dance of Death instead of Paschendale! After a tough beginning of the week, working three nights on a row, and with some odd computer issues (does anybody know why a computer can get frozen just by trying to check your e-mail but not going to other sites?) still unresolved, I totally missed Wearing Handmade Wednesday, but I thought I could share some photos with you guys of some of my trips, so Traveling Thursday has just been born! Today, I'll just share a few photos of my first trip to the US, with some of my co-workers, where I visited Phoenix, a very snowed in Grand Canyon, Las Vegas & San Francisco! As a big Charmed fan I wanted to visit San Francisco, and fell in love with the city, I really want to go back with the bf eventually! We arrived just in time for Thanksgiving! The Pacific Ocean and my favourite bridge in the world! Did I mention I really like the Golden Gate bridge? 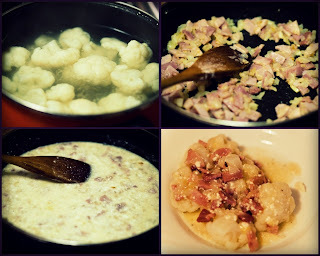 Monday Munchies: Cauliflower with Ham! Monday again, and this week is once again time to feed the tummy! I'm always willing to try new recipes, and even more when they're new ways to eat some veggies that I'm not too keen on, since I'm always trying to eat as many different veggies as often as possible. - Cut the ham in cubes. Clean the cauliflower and separate into florets, then wash them. Peel the onion and chop it finely. - Boil the cauliflower in salted water for about 10 to 15 minutes. In the mean time, heat the oil in a nonstick skillet and fry the onion for about 7 to 8 minutes until translucent. - Add the ham and sprinkle with the flour. Let it brown a bit so it loses the raw taste and slowly pour the broth while whisking it to dissolve the flour. Salt & pepper to taste and boil during 3 to 4 minutes stirring often. Add the yogurts and simmer it for another 2 minutes. - Drain the cauliflower and divide into the 4 plates. Cover with the yogurt & ham sauce and sprinkle it with some paprika to taste. Wash & dry the parsley, separating the leaves and decorating the dishes with it. Saturday Song: Where Did You Sleep Last Night - Nirvana. And I decided that I wanted to listen to some Nirvana, and went straight for my favourite way to listen to them, their Unplugged in New York album. After a very busy day at work yesterday, with a double shift, and some nice sleep this morning after the night shift, I'm all ready to share with you all another Wearing Handmade Wednesday entry! Today's entry has also been dug up from my old photos from the HDD, which is proving quite fruitful, and I've realized that I haven't shared quite a few old time sellers! Wearing my Madfoxes Stormtrooper halter top! Madfoxes is one of those sellers I discovered years ago on eBay, selling bands recons and the occasional geeky one, like my Stormtrooper halter! As most handmade seller she made the move to Etsy when eBay changed their policies, and she continues to sell her tops there, so if you want a band summery top, you'd do well to check her shop! 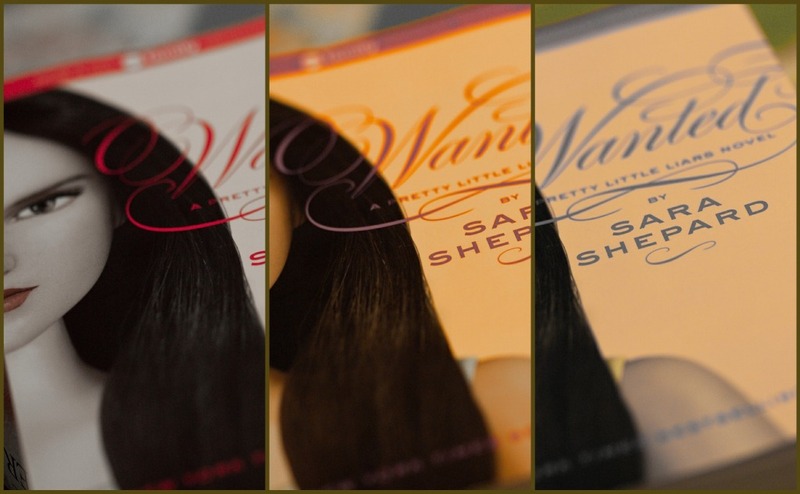 Mark This Book Monday: Pretty Little Liars Series! Another Monday is rolling in, and what a better way to start a new week than with an entertaining series of books to read! Mark This Book Monday today is all about the Pretty Little Liars! I actually heard about the TV show based in the books before the books themselves, and I started watching the Pretty Little Liars ABC show before I got to reading the books, but since I'm a very impatient person, and all the mystery about A in the show was driving me bonkers, I decided I needed to catch up with the books. I'm pretty sure you have heard about them, if not the books, the show. Four pretty girls from this perfect town called Rosewood, share a secret (or a few) and their common best friend disappeared, is then found dead, so there's a murder. They start receiving messages from a mysterious A, threatening to reveal their secrets, only known by their dead friend Allison. If you can get past all the brand naming here and there (or if you particularly enjoy that, good for you), they're very fast and very entertaining books, with twists and tricks, and false clues leading you in the wrong direction, like any good murder mystery book. Upon finishing the one I thought was the last book, Wanted, all the mysteries seem to be solved, but there is a little something left there... and I guess that where the next two books will be picking up from. I'm intrigued to see how Sara Shepard is gonna move the series from the ending point of Wanted forward, and I also need to watch on the show, I have the last two episodes to watch, before the premiere of the second season! Saturday Song: Take That, my guilty pleasure! I just wanted to share a video and a song from a group that were my love & my obsession when I was 14-15 and that I've now rediscovered on their re-grouping, and that are now my guilty pleasure... ladies & gentlemen, Take That and The Greatest Day! Take the advice of this song, stay close to the ones you love and think that always, this day could be the greatest day of our lives, and work to make it so! Today I want to show off an pair of old photos, wearing a great recon by ReVamporium! I discovered her on eBay, quite a while ago, when eBay was full of handmade goodies. 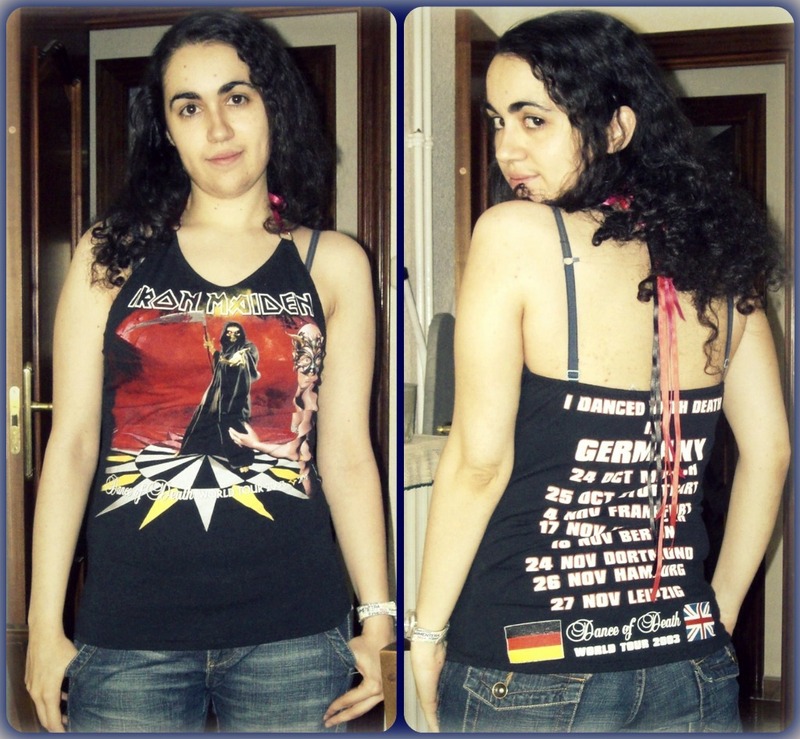 She then did move to Etsy, and she is still offering great recons of heavy metal & rock'n'roll bands in custom sizes! Check her shop out! 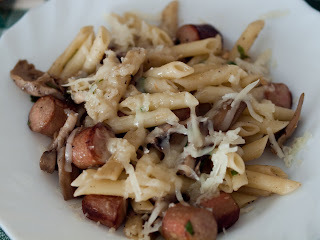 Monday Munchies: Macaroni with Sausages! On a very stormy Monday, there's nothing like a yummy recipe to raise the spirits and if it's a pasta dish, it'll give you an energy kick! - 200 gr sausages (I use precooked ones but you can use fresh). - Clean & wash the mushrooms, and cut them in fours. Wash the parsley, drain and separate the leaves. - Cut the sausages in bit sized pieces. In a nonstick skillet, saute them for about two minutes with enough oil to cover the bottom of the skillet. Add the mushrooms, and the garlic, peeled and cut, and continue to saute, stirring often, for about three more minutes. - Boil the macaroni with about 1 litre salted water till it's al dente (tender) and drain it. Add them to the skillet with the sausages & mushrooms, add salt & pepper to taste and saute all together to combine. - Serve with the parsley leaves and the shredded cheese. Enjoy! 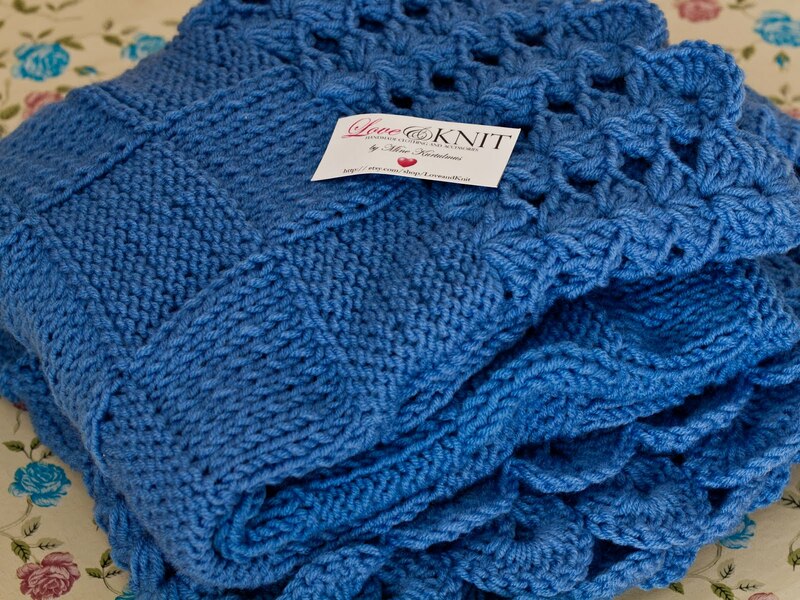 Friday Feature: Love And Knit!! It's finally Friday and so there's a new feature to share with you all! 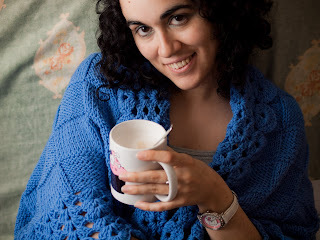 This week I wanna show you something that might no be ideal for the weather that's coming, but a nicely knitted cardigan can be a blessing on a cool summer night! 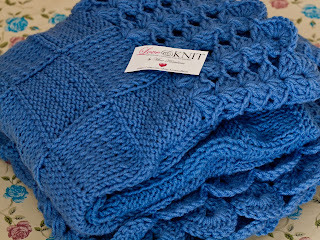 I had been in love with Love & Knit's cardigan for a long long time, and I was waiting either for a sale or for a time when the dollar was a bit low, and my Euros were worth more! That time came a lil back, and I started trying to decide which colour I wanted my cardigan to be, and though the ones she has available are lovely, I saw the ideal colour in her shop in one of her slouchy hats. I had read she did customs, so I asked Mine via convo if she'd be willing to make her cardigan in blue, and she was super nice and said that she'd happily knit it in any colour from her shop I wanted! Mine designed and knits every garment when you order them, so for any cardigan it can take up to two weeks to knit it, and then you need to count for shipping time from Turkey (which in my case is not too far away, since it's only on the other side of the Mediterranean). Truth be told I was ready to wait for as long as necessary, but Mine shipped my cardigan & it arrived in barely the two weeks she said! I love the colour I chose for my cardigan, and I'm very happy I went for a custom colour, that way my cardigan is more my own! 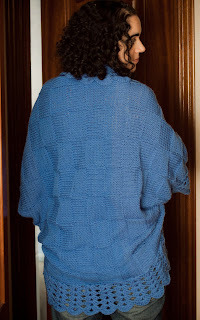 When it arrived, I was blown away by how so well knitted it is, but I was also a bit confused as how to wear it properly, but once I figured it out, it's great cause there's no up or down, you just have to grab the sleeves, fold a side for the neck, and ta dah! 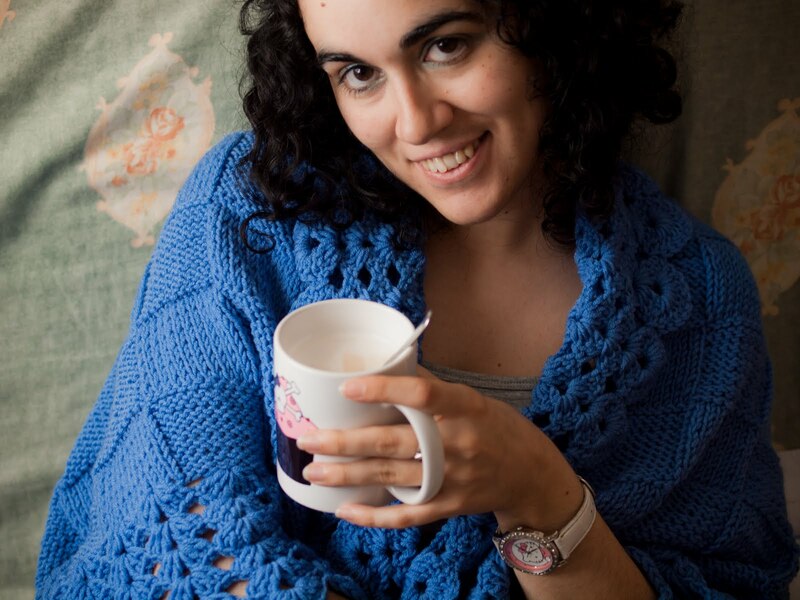 Warm & lovely cardigan on! Wearing Handmade Wednesday: Piper And Paisley!! Wednesday has rolled in, and with it yet another edition of Wearing Handmade Wednesday! My super cute Etta hat from Piper & Paisley! I had never been a hat lady, but that changed when I discovered Piper & Paisley's Etsy shop! 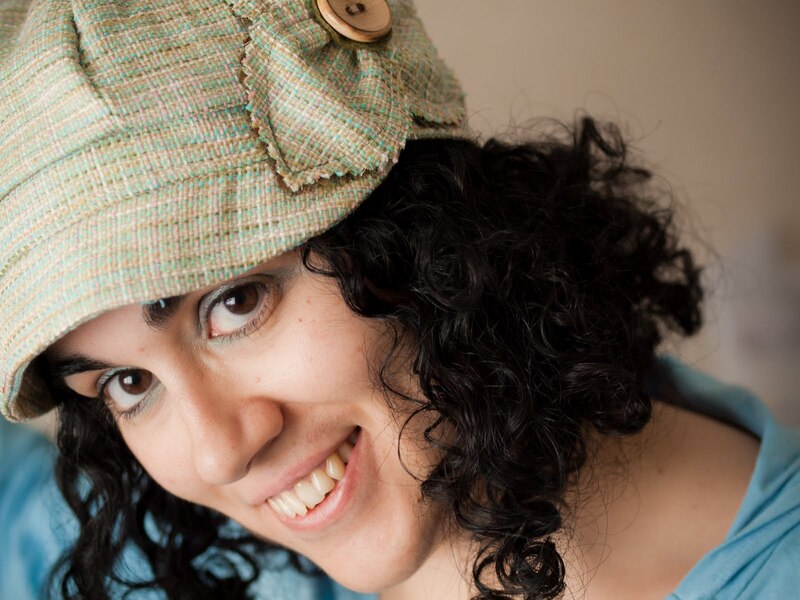 I'm totally in love with her amazing handmade hats, and I already have quite a collection of them! They're ideal for bad & good hair days and simply perfect to coordinate with any outfit to add a lil chic & cuteness! I still have to write a proper Friday Feature about this shop, but for now, I wanna share a great sale they have currently on, with the code SNAILSALE you get 25% off! The only catch, you have to wait 1-5 weeks to get your hat(s)!